Whether it is T-shirt to wear as ready-made or undershirt to wear under clothes, you can benefit from a large choice of models and brands in this category of T-shirt for men. The best-selling undershirts are V collar undershirt in 100% cotton. If you are looking for this model, we offer you EMINENCE undershirts of very good rapport quality-price. There is also round collar. EMINENCE also offers a line of undershirt in cotton of Egypt, a soft and light material. You will find very nice T-shirts from EMPORIO ARMANI, DIESEL, ATHENA or even IMPETUS. Short Sleeve T-shirts There are 71 products. This line of underwear Eminence offers a natural and super soft material; micro modal. t-shirt in modern colours with a skin to the touch sensation. (90% Micromodal 10% elastane). This V-neck Hilary Hom t-shirt offers a very nice 100% combed cotton material with an excellent quality/price ratio. 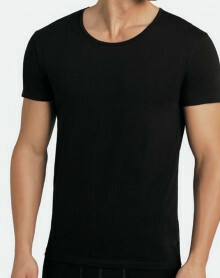 This collection is the best-selling brand Hom men's t-shirt. This Impetus t-shirt are made of extra fine cotton. The Premium line contains a high percentage of spandex (10%) which brings comfort. This round neck new Hom Harro t-shirt offers a very nice 100% combed cotton material with an excellent quality/price ratio. This collection is the best-selling singlets for men brand Hom. T-shirt HOM of the collection Business model Smart Cotton. 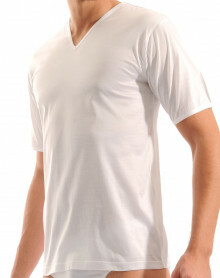 This Impetus V-neck t-shirt offer a very nice 100% mercerized cotton material. This Impetus round neck t-shirt offers a very nice 100% mercerized cotton material. T-shrit to wear under a sweater or shirt or t-shirt to wear as a garment, MesDessous.com has selected the best brands of T-shirt short sleeves. Whether the classic Eminence or HOM 100% cotton or the Emporio ARMANI short-sleeved T-shirt, DIESEL, you have the choice of shapes, materials and Colours !! !